Justin Benson and Aaron Moorhead are two names that you should probably commit to memory, because while you most likely have no idea who they are now, they are seriously on their way towards significant prominence in the underground world of film. Both have been making feature films together since 2012, with their debut feature Resolution earning significant praise for its genre-bending thrills and levels of suspense, while their 2014 sophomore body horror feature Spring earned acclaims from other filmmakers including Richard Linklater and Guillermo del Toro. 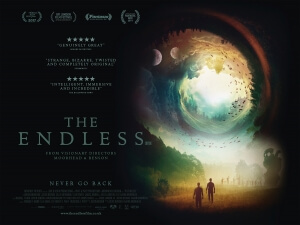 Their third feature, The Endless, is what we are talking about here today, and not only is it by far the most exposure any of their films have received due to its more prominent advertising and strong word of mouth following its debut at film festivals, but conceptually it is also their most ambitious film to date – and coming in without having seen either of their previous two movies, this one is enough for me to see these guys as serious talents worth paying attention to. Benson and Moorhead take on numerous roles behind the scenes, as they usually tend to do, with both of them receiving directing, producing and editing credits, while Benson is credited as the sole writer and Moorhead as the cinematographer. They also play the two lead roles, Justin and Aaron (I’ll leave it to you to guess which one is which), two brothers who ten years prior had escaped what is described as a “UFO death cult”. One day, they receive a mysterious package containing a bizarre videotape featuring one of the cult members (Callie Hernandez), and fuelled by curiosity as well as a desire for closure they decide to head back to the compound from where they once fled. Once there, they become reacquainted with their old friends and the de facto leader Hal (Tate Ellington), but a series of increasingly bizarre events – including one strange game of tug of war with an unseen entity – leads them both down a path that will leave them questioning everything they know, and whether or not they want any part of it. It’s a difficult movie to describe without going into too much detail, because there are things about it that are best left unsaid until you actually see it. It is a slow-burn, but with everything that’s going on you grow more and more curious as to where it’s actually leading you towards, and what the eventual outcome will be. Benson and Moorhead’s greatest strength as directors is in building the momentum without letting it go too far over the top; everything is kept relatively grounded, from the naturalistic performances to the way it uses cinematography, editing and music to build a steady but believable reality. There’s a clear adoration of H.P. Lovecraft in their work here – solidified by a quote from the author at the very beginning of the film – but they wisely keep the big threat largely hidden in the shadows, leaving the unknown to remain that way and to let the audience imagine instead of spoon-feeding it to them. Their work here is astounding, and effortlessly impressive given that they were working with a fairly small budget, which just goes to show that a film doesn’t need groundbreaking visual effects to be great; just a smartly laid-out story and interesting characters is more than enough for a film to succeed, and this film has both of those and more. The film earns its several chills thanks to their tight direction and smart writing, not to mention their two lead performances that are as compelling as they are genuine. They approach this material with straight-faced seriousness, but aren’t afraid to inject a good sense of humour into it as well, and there are many parts of this film which do genuinely raise a chuckle or two. A lot of that is down to how both Benson and Moorhead work very well off of each other, with great chemistry that really makes you believe that these are two brothers talking to each other, either arguing or just being playful and mischievous like most brothers tend to be. When the film gets more into what’s happening, and we as well as they start to learn more about the rather sinister forces at play, admittedly it does take a little while to figure out what’s actually happening (not to mention a repeat viewing, which is highly recommended anyway) but you do kind of get the gist of it and are so enthralled by this strange ride that you’re on board to see exactly how this all pays off in the end. Since seeing this film, I did a little more research and discovered that it shares very close DNA with their first feature, Resolution. In fact, characters from that film do indeed show up at one point to offer a bit of continuity during a certain memorable sequence, and when you discover a bit more about the plot of that film – or better yet, actually watch it – you’ll realise that their being here in this film makes all too much sense in the bizarre universe that has been established. This film’s Blu-Ray version – which is being released around the same time as its theatrical run – contains a copy of Resolution, which also comes highly recommended, and I implore you to buy this version so you can not only watch this film, which really is quite an extraordinary little gem, but also the film that fits neatly alongside it like a jigsaw puzzle piece. Having seen only one of their films so far, I can already see the appeal behind Justin Benson and Aaron Moorhead’s niche approach to filmmaking, and if time is kind to them I can see them and their films reaching cult film status, kind of like how Donnie Darko catapulted director Richard Kelly and star Jake Gyllenhaal into the spotlight after that film debuted. I would very much like to see some of their earlier work, not to mention whatever they end up working on next, because like the cult that the two brothers return to, I find myself coming back to this film more and more, thinking about its ideas and concepts that are far more ambitious and level-headed than many other similar low-budget genre filmmakers like them. Whether it’s on DVD or the preferred Blu-Ray, or if you want to seek out wherever it’s playing on the big screen, you won’t regret it in the slightest. The Endless makes up for its low budget through an increasingly fascinating and bizarre story held together by ambitious concepts and strong performances by its two leads and filmmakers Justin Benson and Aaron Moorhead, which makes it one of the year’s brightest gems that’s completely unmissable.